Chesapeake Seafood Caterers provided delicious crabs, grilled burgers and hotdogs, coleslaw, potato salad, corn on the cob and a yummy vegetable crab soup. Not to be forgotten were the desserts! They offered a variety of pies from apple to pumpkin, along with their chocolate frosted brownies. If you thought the crab line was long, you should have seen the line for the sweets—it was impressive! EWMG had 4 door prizes to raffle off this year: 2 tickets to this year’s Waterfowl festival, 2 Carvel Hall crab knives, a wine basket, and a $50 gift certificate to Mason’s. The winners are as follows (and pictured in our photo gallery from the event), Karen Pritchard will be going to the Waterfowl, Diann Prahl won the crab knives, Mary Story took home the wine basket and Bob Ukkleberg will be enjoying a meal at Mason’s in the near future. We were able to introduce our newest team member, Chris Gostomski, to all of the clients who attended if they hadn’t had an opportunity to meet her yet. Clients were also able to catch up with a past team member as well since Bertha Bryan was able to join us again this year for this year’s feast. We once again were impressed and touched by the response we received by way of toys for our Marines Toys for Tots collection. We will be continuing to collect toys through November for anyone who did not attend but would like to donate a new, unwrapped toy. The collection box is located in our lobby and toys may be dropped off Monday through Friday 8am to 4pm. 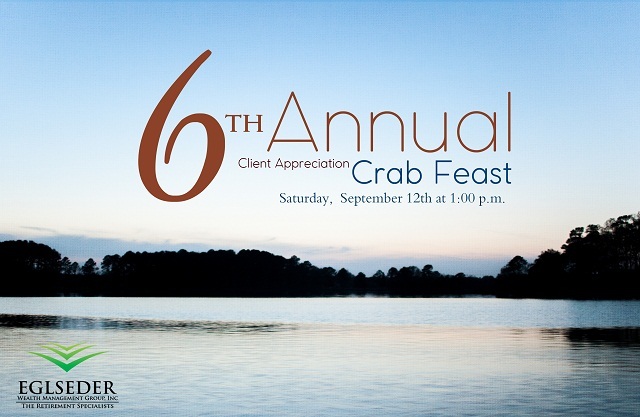 This year’s Crab Feast was as lovely as ever and we enjoyed seeing our clients meet new friends, catch up with old friends and overall just laugh and talk together and have a good time. We always enjoy getting to spend time with each and every one of you and are ever grateful to have you as clients. It is often discussed amongst our team that we honestly feel we have the very best clients around. Thank you for your continued business and trust in us.